The Soviet military government this morning is lifting its interzonal barriers to truck traffic to Berlin just as mysteriously as the "little blockade" was imposed. A Russian officer on the north border crossing connecting this city with Hamburg informed British authorities today that traffic now will be allowed. A check in the south shows that the Soviet border guards also have been ordered to open the crossing points at Hof and Coburg which connects Bavaria with the north. Thus after two weeks of yammering and snaffling which finally resulted in the opening of the single checkpoint at Helmstedt, we now may have the traffic situation completely back to normal. Why the Russian move at this particular moment? Nobody knows. The East-West struggle in Germany today is consequently more quiet than it has been in many months. The lifting of the Russian border restrictions undoubtedly will serve to expedite the meeting on Wednesday of the four Berlin commandants assigned to normalize the life of the city. And there is apparent progress in the negotiations between the East and West German economic commissions now struggling to revive trade between the split sections of the city. However, this latest period of good feeling is not expected to last long. The reason is the arms aid program for Western Europe now under debate in Congress. The Communist press slams the proposal this morning, calling the proposed American shipment of arms for the defense of Western Europe an outright anti-Soviet maneuver, a move to force Russia out of the United Nations, and finally to establish an "international security force" without Soviet participation. There will be a serious attempt to make the modus vivendi agreement in Germany workable—that a genuine effort to arrive at an Austrian peace treaty will be made—but at the beginning of this fall or winter, East-West relations will again become critical. For that is when American arms aid is expected to start arriving in Europe. But it must be remembered that making predictions of any sort in modern Europe is a very risky business. It is so quiet in Berlin today that one could hear a protest drop—only there are none. The four deputy military governors meet in a half hour, and there is every prospect that they may reach agreement on procedure for their economics experts trying to work out currency and financial difficulties. Tomorrow the four Berlin commandants will have their second meeting under the modus vivendi arrangement. Maybe it's the rare good weather we are having in Berlin these days, but there appears to be a good chance that the East-West "live and let live" policy in Germany may work out. The best evidence of this is the Russian decision to comply with a British protest against the closing of zonal crossing paths leading to Berlin. Russia's transportation chief, General Dratvin, yesterday ordered the checkpoints opened, and in an extremely polite letter he denied that the Soviet military administration intended to impose any kind of blockade. He said it was all due to the failure of German truck drivers who were doing illegal trading in the Soviet zone and who did not have the proper invoices of their cargoes. In fact, Dratvin declared, Soviet authorities have maintained an essentially benevolent attitude toward Western Berlin—a benevolent attitude, and I quote, "which will be continued in the future." I don't know what the Russian definition of benevolence is, but this letter certainly is a far cry from the anti-Western blasts which have answered our protests in the past. At any rate, traffic is running normally today, and if this be only a temporary respite in the East-West Cold War, all of Berlin is relaxing and enjoying it. And speaking of transportation, the airlift is still delivering the goods, a fact that tends to be overlooked in considering the larger issues. Yesterday American and British planes flew in 8,000 tons of supplies. There is no relaxing there. You remember during the last war the V-sign became the symbol of resistance to German occupation. 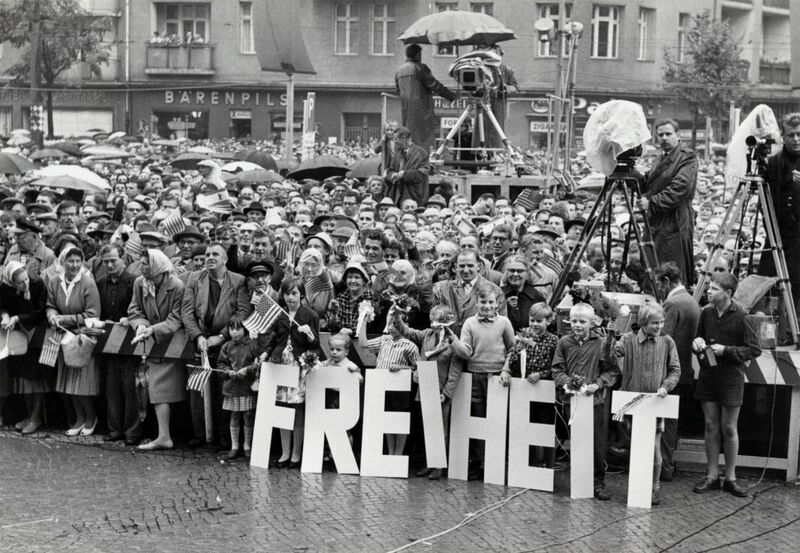 Well, today we have reports that the letter F—standing for freiheit, or freedom—is appearing on walls in cities in the Russian zone. Local Communist leaders are said to be advising schoolteachers to lock up the blackboard chalk in an attempt to stop what may be the signs of an increasing resistance to Soviet occupation.